At the beginning of the First World War the German U-boat (unterseeboot or submarine) had become a major threat. Its large-scale destruction of merchant shipping caused not only great loss of life but also a fear that the British population would be fatally starved of materials and food. At one stage there were only six weeks of food reserves left (April 1916). 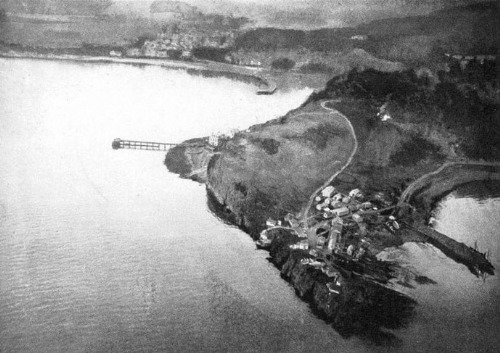 Between 1915 and 1918 the Admiralty Experimental Establishment Station located at Hawkcraig Point in the Firth of Forth’s coastal village of Aberdour, Fife was the centre of a highly concentrated effort to defeat the German U-boats. It was the Navy’s main hydrophone research and training base. These hydrophones (or underwater microphone receivers) were the forerunner of today’s sophisticated sonar systems. The naval establishment was named HMS Tarlair. The work carried out at HMS Tarlair is of local and national interest. During its short period of operation, major technological advances were achieved, not only in the detection of submarines, and it was one of the first instances of collaborative work between civil and military scientists and researchers. The staff from HMS Tarlair were also responsible for fitting submarines with hydrophones and issuing special sets of hydrophones to the 1,500 drifters and motor launches in the Auxiliary patrol, which was the major part of the Navy’s anti-submarine force. This is not only the story of the development of new technology, but also of the characters and personalities involved. 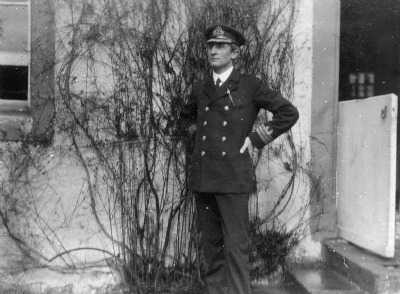 The Hawkcraig experiments were under the command of Captain C P Ryan, RN. From 2013 the Aberdour Cultural Association has been supporting a community-driven local history project which has uncovered a significant amount of archive and other material. Please browse this website to see a little of what we have found and learn something of the fasinating history of HMS Tarlair. 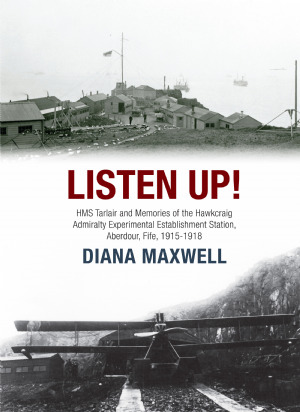 Aberdour Cultural Association is proud to announce the publication of "Listen Up!" the first comprehensive history of HMS Tarlair. Diana Maxwell draws together for the first time local and national records with personal recollections of people who lived and worked around the base. "....a valuable addition to our knowledge of this little known, but important research station," Mr E R R Dunstane MBBS, BSC, FRCS (T&O). Contact the Aberdour Cultural Association (aberdour.culture@outlook.com) to order a copy (£5.99) or find your nearest stockist. The book is approximately fifty pages long and contains many images of the base and the personnel who worked there. And all those that have made available information and images.